The University of Pacific Display Wall provides a large-scale, high-resolution display, which is suitable for any computer-based graphics or video. The display wall makes use of nine monitors that can either act as one giant monitor is nine individual displays. The display wall can be used for large-scale data analysis and visualization that provides faculty, staff, and students in fields such as physics, chemistry and biology a way to visualize large-scale data at very high resolution and thus enhances the understanding of data. It can be especially useful when people try to recognize patterns in a time-varying data as data at multiple time steps can be visualized simultaneously on multiple panels. The display wall supports collaborative research when several people would like to analyze a high-resolution image, compare multiple images or examine detailed artifacts and diagrams. It can be used to display large software design artifacts, such as UML or ER diagrams. 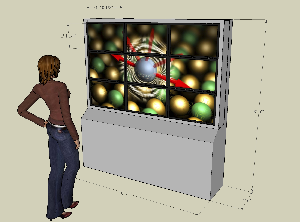 The display wall can also be used to display scale computer simulations. The display wall can also be used for simultaneous visualization of variations of algorithms and implementation techniques. This is particularly useful for graphics and animation algorithms, where the differences between results are best examined visually and in real time.